The central span, from the northwest side, of the first new (rather than replacement) bridge over the Cam in Cambridge since the Elizabeth Way Bridge opened in 1971. 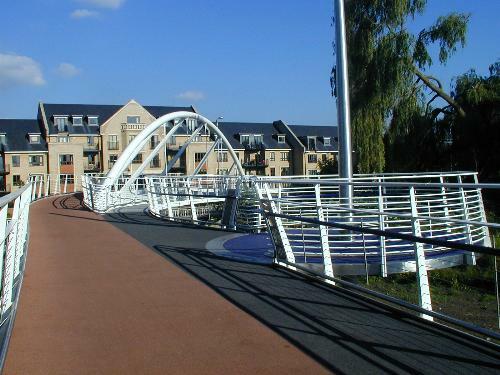 This combined pedestrian and cycle bridge officially opened on 5 June 2008, and is easily the finest public bridge over the river. The bridge cost around 3 million pounds (almost 4 million Euros) and this is partly due to the complex location. The river regularly floods on this side of the river and the general topography required that the bridge had to be extended for over 100m in this direction. On the other side of the river, the bridge lands in a road that runs parallel with the river and to provide a suitable slope it also had to be extended, but not as far. The total length of the bridge is around 200m, even though the river is less than 20m wide at this location. The seating area at the right is one of two, with the other one also located on this side of the river but near where the bridge structure ends. These were designed by the artist Gerry Judah. Unfortunately the views are not great from either seating area, even this one nearer the river. The seats are steel, which is hard wearing but cold to sit on, so these will only be used in fairly warm weather. And they are as likely to be used by drunks as by people contemplating the not-so-great view. As can be seen in the photograph, the actual part of the bridge over the river splits in two, with the higher (left) side for cyclists and the lower (right) side for pedestrians. This works quite well although it is inevitable that some cyclists will use the pedestrian side and vice versa. It is a pity that they could not have put the seating areas on either side of the bridge here instead of further afield. Although this bridge was not strictly speaking needed, since there are perfectly adequate nearby bridges in both directions, it will no doubt prove particularly popular with cyclists because it has no obstructions and is wide enough to avoid collisions with pedestrians.